Make sure your family or business is prepared in the event of fire evacuation by mapping out an escape plan ahead of time on the provided grid. Includes instructions and tips. 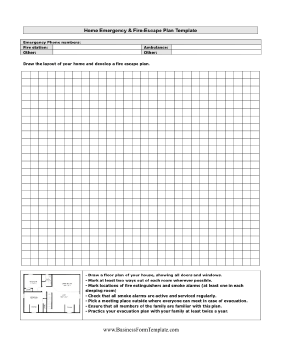 - Draw a floor plan of your house, showing all doors and windows. - Mark at least two ways out of each room wherever possible. - Check that all smoke alarms are active and serviced regularly. - Pick a meeting place outside where everyone can meet in case of evacuation. - Ensure that all members of the family are familiar with this plan. - Practice your evacuation plan with your family at least twice a year.